I'm new to the Duet world. I need to setup a printer with indepented dual extruders + bltouch. Was this the guide you were following? If you look at https://duet3d.dozuki.com/Wiki/Expansion_breakout_board you will see that the expansion breakout board makes heater6 and heater7 PWM pins available along with 5V power on 3-pin connectors. So connect the bltouch power and servo pins to one of those. The black and white wires go to the Z probe connector as usual. @dc42 Thank you so much. I will check this out. @phaedrux yeap, that's the one. Maybe I missed something. @phaedrux Actually looking again it was not the same link.. thanks for that! @dc42 Another thing... I've looking at the forum but I could not find the exactly case I'm trying to implement here... sorry if it brings any redundant question. Does the External Breakout Board can handle a NEMA 17 for the independent X carriage I want to implement, or should I connect external driver to it? The info I've got in one of the wikis I cluld not understand (lack of knowledge on my side). 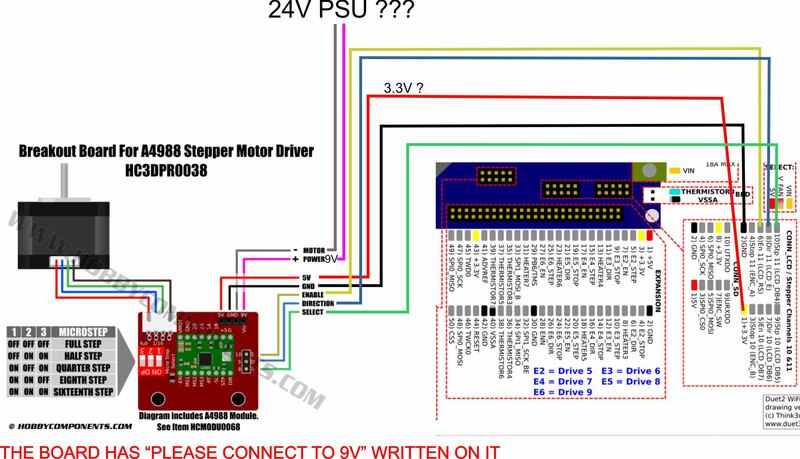 If I'm not wrong the info says if I don't need more than "2mA @ 3V on the step" I can go with it alone with no external drivers, which I can't tell for sure if that's the case for me. 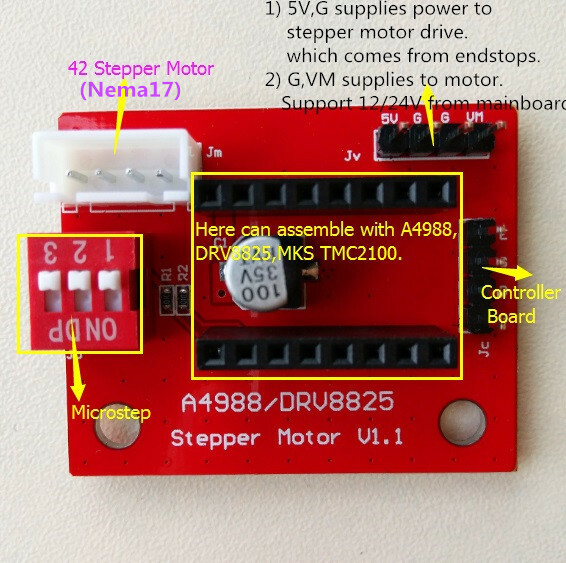 The external stepper driver interface board can't drive a motor directly. You can't connect a stepstick or Pololu-style driver to the external stepper driver interface board, but you can connect 1 or 2 of those drivers to the CONN_LCD connector. Make sure you add a 100uF capacitor between the motor supply voltage and ground, close to the driver. You can mount the drivers modules and capacitor on a piece of stripboard, or buy a bare RAMPS PCB to mount them on. I was not talking about connecting the stick directly on the extension board, I meant to connect this extender to the Extension Breakout or even to the Duet Wifi, this way would it be posible ? You could connect that board directly to the Duet expansion connector, or to the CONN_LCD connector; but where that board says "5V" apply 3.3V. @dc42 Thank you, I will post in some minutes the picture of the wiring here... thanks a lot for your attention! RED BOARD has 9V ... where should I get that from? RED BOARD has 5V and @dc42 told me to use 3.3V ... I see that the pins on the Duet Wifi has 3.3v nomination, but when thay get to the Expansion Breakout they are all 5V. 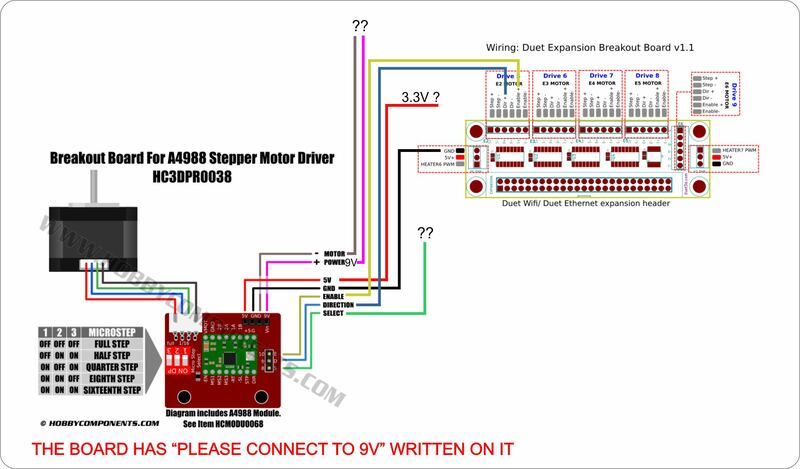 Motor + and - ....should I connecto to Step + and - ? I did not say you could connect it to one of the outputs from the external stepper driver breakout board. I don't know why it is telling you to connect Vm to 9V, I guess it means 9V is the minimum voltage you can apply to Vm for the stepper driver chip to work. The capacitor in your photo is rated at 35V. So you can connect that pin to VIN. Important: make sure you have a good connection between the ground pins on that board and Duet ground. If the ground wires break then you will end up feeding VIN into the Duet output pins that you use to drive STEP, DIR and EN. "I did not say you could connect it to one of the outputs from the external stepper driver breakout board."... Sorry, I assumed that... so, it seems the breakout board in my case is useles, since I can wire both external motor driver and the BL Touch direclty to DUET Wifi, correct? Or... in the case of the External Motor, should or could I buy another unit that is compatible with the Duet External Brekout ? The fact is I need another Axis to be added to control the Independent X carriage. Would the Duet Expansion Breakout connect seamlessly with a TB6600 external driver? thanks, you are being very helpful! Is this wiring correct in case I decide to use the small red board I have? Please note the questions on the previeous post. Using the Pul(Step), Dir and En. If you are connecting it to the expansion breakout board then you should connect the + and - signals to the board. Since the DRV8825 has miliamper settings done physicaly, should I let the U axis with no value inside the motor current section on the firmware? or if I set it on the firmware it will override the physical settings? I followed this guide (https://duet3d.dozuki.com/Wiki/ConfiguringMultipleIndependentXcarriagesCartesian) until I reaced the HOMEALL.g configuration. I didn't want to mess with tools until I get the motor of the U carriage running well. But nothing hapened, I can't home nor move the U axis. @3dealo For external drivers the current setting in firmware has no effect.